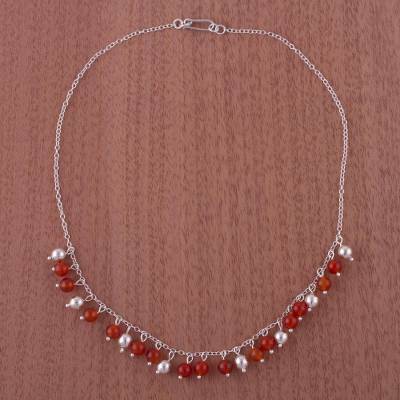 Handcrafted Sterling Silver Beaded Carnelian Choker Necklace, "Sunny Harmony"
Carnelian suns and sterling moons engage in a dance of glistening harmony. Suspended from a silver chain, they are showcased in the exclusive design of this choker by Peru's Carol Noriega. "The Sun & Moon from Peru"
An item on my wife's wishlist that I surprised her with and she absolutely loved it. Well crafted and the fact we can read a small biography just makes it that much more treasured. It amazes me how 1 person can recreated such excellent work repeatedly, but Carol Noriega can do it with ease. Thank you for letting your talents shine. The charm and beauty of the work is just bewildering, there is not a person who would not be proud to wear this beautiful jewelery. Thank you for the beauty you give to our every day. Your creations are full of joy and wonderful colour which can be worn on any occasion and complement any dress. Thank you, and may God Bless you. I bought the Azure Worlds earrings, and I absolutely love them! Such a simple and beautiful design and they go with everything. Thank you, Carol, for such wonderful craftsmanship!